One of the most engaging live performers of his generation, the multi award-winning pianist Jean-Efflam Bavouzet regularly works with conductors such as Pierre Boulez, Andrew Davis, Vladimir Jurowski, Vasili Petrenko, Daniele Gatti, Valery Gergiev, Kiril Karabits, Neeme Järvi, Andris Nelsons, Ivan Fischer, Ingo Metzmacher, and Krzysztof Urbánski. This season Bavouzet made his debuts with the San Francisco, Montreal, Dallas and New Jersey symphony orchestras (under Vasily Petrenko, Kent Nagano, Marc Albrecht and Susanna Mälkki respectively)and appeared with the Hungarian National Philharmonic Orchestra, Sydney Symphony (Vladimir Ashkenazy) and Netherlands Radio Philharmonic Orchestra (James Gaffigan), as well as with the Orchestre Philharmonique de Strasbourg and Orquestra Sinfonica do Estado de São Paulo. In July returning to Avery Fisher Hall he will open the Mostly Mozart Festival under the baton of Louis Langree and appears at the Proms with the BBC Philharmonic Orchestra and Gianandrea Noseda. Further ahead, he will debut with the Pittsburgh and Seattle symphony orchestras, and return to Tivoli Symphony Orchestra. An equally active recitalist, Jean-Efflam Bavouzet regularly performs at London's Southbank Centre, Wigmore Hall and the Cheltenham Festival, La Roque d’Anthéron and Cité de la Musique, Brussels' BOZAR and the Forbidden City Concert Hall in Beijing, where he recently received the annual Classical Elites Beijing Instrumental Recital of the Year award for his complete Beethoven sonatas cycle. Recitals in the 2012/13 season include performances at the Concertgebouw Amsterdam, the National Centre for the Performing Arts in Beijing, Sociedad Filarmónica de Bilbao, Casa da Música in Porto, the Moscow Conservatoire, and at the Schwetzinger Festspiele. 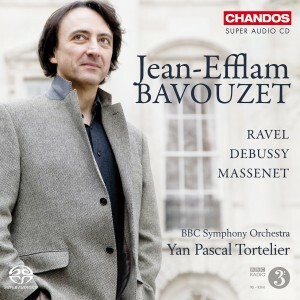 Renowned for his work on disc, Bavouzet has won Gramophone awards for his recording of concerto works by Debussy and Ravel with the BBC Symphony Orchestra and Yan Pascal Tortelier, and for his fourth volume of Debussy's Complete Works for Piano. 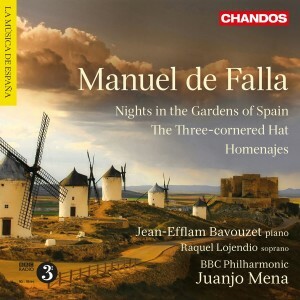 His interpretations of Debussy and Ravel have also earned him two BBC Music Magazine awards and Diapason d'Or, whilst his first volume of Haydn's Piano Sonatas received a Choc de l'année and his Bartók Piano Concertos disc (with the BBC Philharmonic Orchestra and Gianandrea Noseda) was shortlisted for multiple international awards. 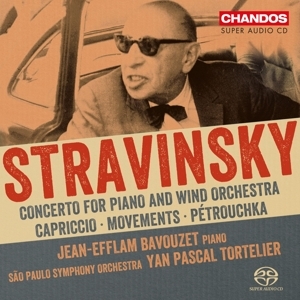 Bavouzet records exclusively for Chandos and current recording projects include a Beethoven Piano Sonatas cycle. In 2012 Gramophone nominated Bavouzet as one of their Artists of the Year. Named ‘Artist of the Year’ at the 2012 International Classical Music Awards, his recent highlights have included an appearance at the Mostly Mozart Festival in New York with Louis Langrée, a BBC Prom with Vladimir Jurowski and the London Philharmonic Orchestra. He returns to the Boston Symphony Orchestra, Deutsches Symphonie-Orchester Berlin, Budapest Festival Orchestra and the Philharmonia Orchestra, as well as performances with the Orchestra National de Lyon, Tivoli Symphony Orchestra with Kirill Karabits, and in Japan with the NHK Symphony and Kyoto Symphony orchestras. 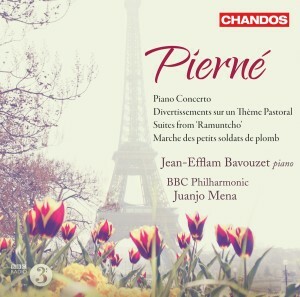 A former student of Pierre Sancan at the Paris Conservatoire, Bavouzet was invited by Sir George Solti to give his debut with the Orchestre de Paris in 1995 and is widely considered as the Maestro’s last discovery. 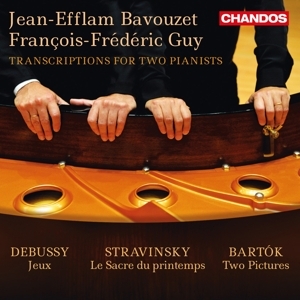 As well as his performing activities, Bavouzet has also made a transcription for two pianos of Debussy’s Jeux, published by Durand with a foreword by Pierre Boulez. He won first prize in the International Beethoven Competition in Cologne as well as the Young Concert Artists Auditions in New York in 1986. Bavouzet is Artistic Director of the Lofoten Piano Festival in Norway.